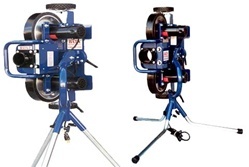 The versatile BATA-2 Baseball | Softball Combo Pitching Machine is the choice of more professional teams every year and the best-selling Bata machine overall. Capable of throwing any type of pitch (fastballs,curves,sliders, drop balls, risers) from either left or right hand delivery, it's maximum speed exceeds 100 miles per hour. Also ideal for throwing grounders and fly balls.The Combo Machine Comes with adjustable softball legs. BATA-2 Baseball | Softball Combo Pitching Machineis the only machine with Soft-Tread Pitching Wheels, designed specifically for throwing real leather baseballs. .JUGS Curveball has one all-in-one ball-joint adjustment. When you loosen the one ball-joint, all three adjustments are loose.BATA-2 has three independent swivel lock adjustments. So, when you loosen one, the other two remain locked in position. The Bata 20 Baseball | 15 Softball Autofeeder feeds balls at 7 second intervals. Featuring an adjustable metal tripod stand and a very durable ABS Housing, this feeder can be used with the Bata-1 Baseball Pitching Machine, the Bata-1 Twin Baseball Pitching Machine, the Bata 2 Baseball Pitching Machine and the Bata B 1 Curveball Baseball Pitching machine. You can use any standard weight leather baseballs or dimpled baseball pitching machine balls or dimpled machine softballs and the Bata 20 Baseball | 15 Softball Autofeeder can be used with any competing machine that uses standard weight leather or pitching machine balls . The push-button Transmitter is used to start and stop the Auto-Feeder from up to 50' away! Came very well packed...and took us about an hour to get everything up & ready. Easy to put togather w/ good instructions. Both baseball & softball pitches are very real...our kids love it. Wow, this is fun. Produces major league pop fly's.